Silver Springs Ranch is a local farm that raises livestock and sells their products at our local farmers market in Martinez, California. They specialize in grass fed and finished beef so I usually pass by their booth but today was different. They had a signboard that said 'Loaded Potato". We were looking for a side dish and this sounded intriguing. 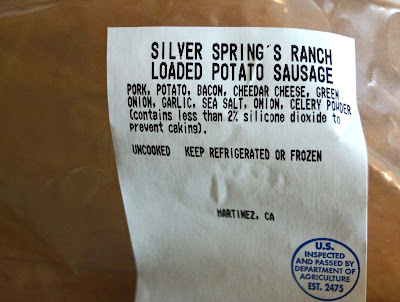 After asking the vendor we found out that it was actually a pork sausage mimicking a 'Loaded Potato". What really sold me was the third ingredient listed in the lower image. That's right; bacon. The vendor said it was really filling because of the potato. Let's give it a try. I cooked it in a two stage process. I brought a pan of water up to a boil. 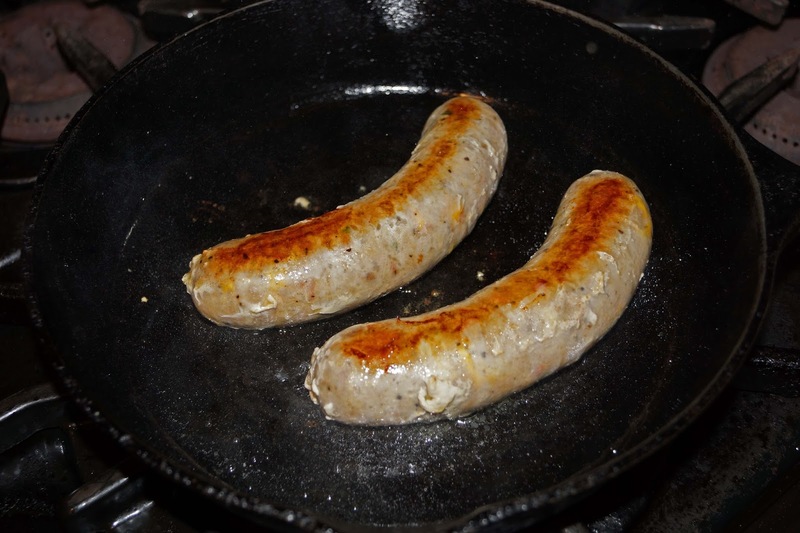 I then turned off the heat and put the sausage package into the pan and covered. After 30 minutes it was pre-cooked and only needed a browning in a cast iron pan. Ms. Goofy loved this sausage. It was very mild and the potato flavor was very prevalent. It had plenty of gooey cheese which Ms. Goofy loved. I on the other had had my usual question. Where is the bacon? Unless you told me I would not have known bacon was an ingredient. I thought the sausage was okay but a little to bland for my fiery taste buds. I did eat every bite so it was a success in that department. Oh what culinary fun we have. I'm with you - since bacon is such a strong flavor, I expect to be able to taste it when it is an ingredient. Big Dude, Where is the bacon? I probably sound like a broken record. They see me coming and say here comes Chilebrown tell him it has bacon and he will buy it.